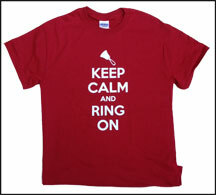 Whether you turned two pages or played the wrong note, or even played the right note at the wrong time, this shirt is emblazoned with the motto that all ringers share. Cardinal red shirt in 100% cotton with white, silk screened image. Ringers are very good at turning cryptic notations on the page into beautiful music. This shirt contains notations for the life of a ringer: Eat, Sleep, Ring, Repeat. Dusk blue shirt in 100% cotton with white, silk screened image. 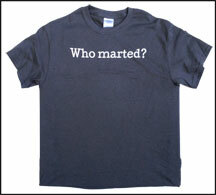 This fun shirt dares ask the question that all ringers have wanted to ask. Charcoal grey shirt is 100% cotton with white, silk screened text.